UIS Speaker Series explores "What's Wrong with White Talk?" 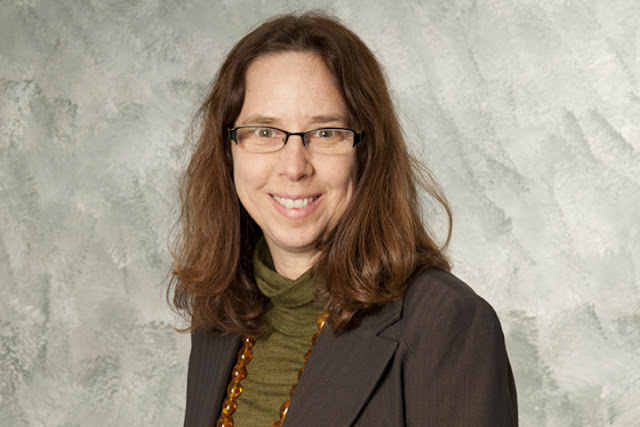 WHAT: The University of Illinois Springfield Engaged Citizenship Common Experience (ECCE) Speaker Series will explore “What's Wrong with White Talk?” with Alison Bailey, director of the Women's and Gender Studies Program at Illinois State University and professor of philosophy. WHEN: Tuesday, February 9, 2016 at 6:00 p.m. DETAILS: While rejecting racism, recognizing shared experiences, and praising equality, sound great, “White Talk” can shutdown important conversations. As Bailey explains, it steers discussion toward the moral goodness of the speaker and away from white privilege, effectively defending the speaker from vulnerabilities like feeling like a participant in privilege or absorbing painful testimony about its harms. Bailey suggests that rather than defend against these vulnerabilities, a better response is to use their power to become open to understanding privilege and to motivate change. Further, she gives us concrete guidance on how speakers can break their patterns of “White Talk” to be better anti-racists. Bailey’s research addresses issues at the intersections of feminist theory, moral and political philosophy, philosophy of race/whiteness studies, and epistemology. She recently co-edited a special issue of Hypatia: A Journal of Feminist Philosophy on "The Reproduction of Whiteness: Race and the Regulation of the Gendered Body," with Jacquelyn N. Zita. Her recent work on philosophical issues related to racism and resistance has appeared in Hypatia, “Whiteness: Feminist Philosophical Perspectives, Feminist Ethics Revisited, and Race and Epistemologies of Ignorance”. She and Chris Cuomo have just co-edited The Feminist Philosophy Reader. This event is co-sponsored by the UIS New Voices on Racial Justice Series and the UIS Department of Philosophy. For a list of other upcoming ECCE Speaker Series events and more information, visit www.uis.edu/speakerseries/. All events are free and open to the public. UIS Speaker Series explores "Transformative Social Justice through Radical Science Fiction"
WHAT: The University of Illinois Springfield Engaged Citizenship Common Experience (ECCE) Speaker Series will explore “Transformative Social Justice through Radical Science Fiction” with writer, organizer, activist and strategist Adrienne Maree Brown. WHEN: Wednesday, February 3, 2016 at 6:00 p.m. DETAILS: Radical science fiction creates space for us to envision socially just worlds filled with alien identities, intersectionalities, and power relations, and also to inspire, organize, and think strategically about social movements in our own world, especially when the stories speak to racism and other oppressions in our society. Thus construed, science fiction becomes a transformative tool, which Walidah Imarisha and Adrienne Maree Brown, co-editors and activists, understood when they brought to fruition Octavia’s Brood: Science Fiction Stories from Social Justice Movements, a collection inspired by Octavia Butler’s work. 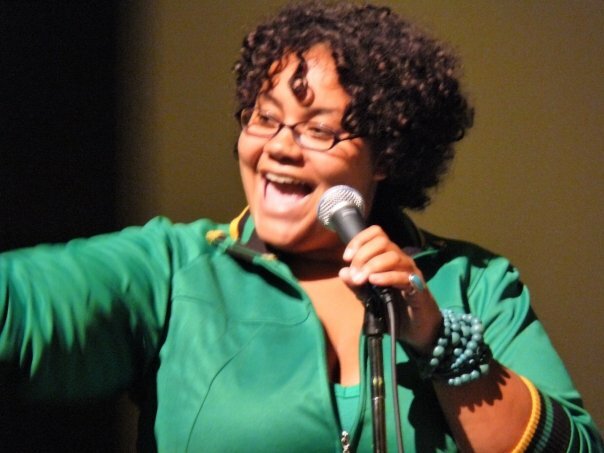 Adrienne Maree Brown, currently a Kresge Literary Arts Fellow, has written for Africana (now Black AOL), Wiretapmag.org, Alternet.org, HuffingtonPost.com, Feministing.com, WashingtonPost.com, Racewire.org, Left Turn; Race, Poverty and Ecology; Yes; and her own blog. Through these and other venues, she has been working to demonstrate the relevance of Octavia Butler’s revolutionary work on social justice through workshops and strategic readers for the past several years. This event is co-sponsored by the UIS New Voices on Racial Justice Series, the UIS College of Arts and Sciences, the UIS Diversity Center and the UIS Student Activities Committee. The University of Illinois Springfield Visual Arts Gallery is pleased to present TROPICALAMERICAN, an exhibition from Chicago-based artist and Puerto Rican native Edra Soto. TROPICALAMERICAN will open on Tuesday, January 19, and run through Thursday, February 25. A reception for the exhibit will take place on Thursday, February 4, from 5:30 to 8:00 p.m.
Soto will incorporate the large gallery windows, a key architectural feature of the gallery, in referencing the decorative iron screens popular throughout Puerto Rico. These screens became ubiquitous in the island’s post-war architecture, due to the security they provide and their ability to allow for ventilation. Today, these iron screens are not only viewed as protection, but also as a piece of the island’s visual landscape. A subtle transformation occurs when removing the screens from their intended use and their specific location. 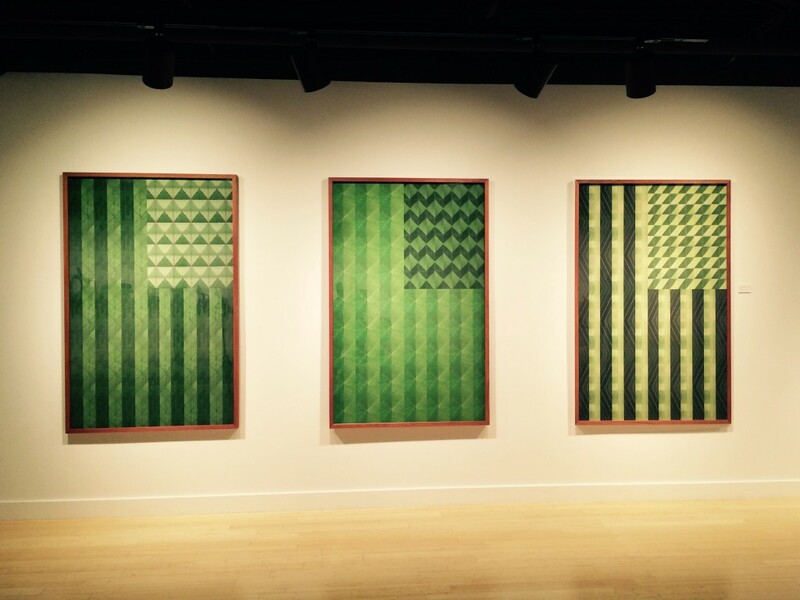 The patterns take on new valences in relation to contemporary art, while prompting viewers to reconsider post-colonial visual culture. Soto’s work seeks to provide an engaging, participatory space that erases boundaries between the audience, the artist, and the work of art. She attended The School of the Art Institute of Chicago where she obtained her Masters of Fine Arts in 2000. She has exhibited nationally and internationally. With her husband Dan Sullivan, Soto designed, fabricated, and currently directs THE FRANKLIN, an artist-run project space located in their home’s backyard in Chicago. The UIS Visual Arts Gallery is centrally located on the UIS campus in the Health and Science Building, room 201 (HSB 201). Gallery hours are Monday through Thursday, 11 a.m. to 6 p.m. For more information on exhibition programming, please visit the UIS Visual Arts Gallery website at www.uis.edu/visualarts/gallery, or contact the gallery at 217/206-6506 or alach3@uis.edu. 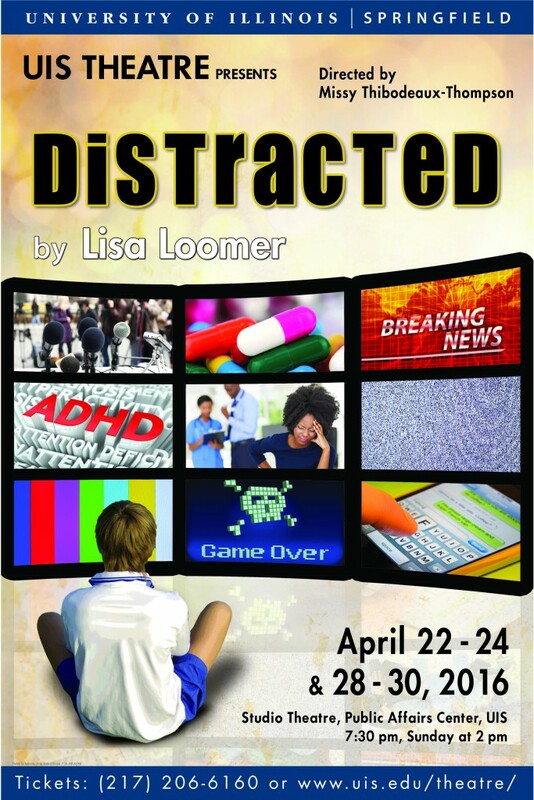 The Theatre program at the University of Illinois Springfield (UIS Theatre) will hold open auditions and crew interviews for their upcoming production of Distracted by Lisa Loomer on Sun., Jan. 24 and Mon., Jan. 25 in The Studio Theatre at UIS. Crew interviews will begin at 6 p.m., followed by auditions at 7 p.m. both nights. Roles and crew positions are open to students, faculty, staff, and community members. Roles are available for three men and six women with some flexibility and doubling possible. Callbacks will take place on Tues., Jan. 26. In Distracted, 9-year-old Jesse can’t focus at school, can’t sit still, and can’t follow directions. Is Jesse simply a typical 9-year-old boy, or is he suffering from Attention Deficit Hyperactivity Disorder, as his teacher suspects? Jesse’s parents clash over this potential diagnosis, their marriage suffers, and Mom struggles to find a solution amid various health professionals–one of whom wants to prescribe Ritalin. Neighbors and friends all seem to have their own diagnoses–and suggested solutions–none of which seem to work for Jesse and his parents. UIS Associate Professor of Theatre Missy Thibodeaux-Thompson will direct Distracted, which runs April 22-24 and 28-30, 2016. For more information on the production, contact Missy Thibodeaux-Thompson at 217/206-8307 or mthom1@uis.edu. You can also visit the UIS Theatre website at www.uis.edu/theatre.